Many different types of fruit trees can be grown in North Florida, although the varieties of some are limited by the weather. Some fruit trees, such as apple trees, require a certain number of winter hours below 45 degrees (chilling hours) to flower and fruit well. Other fruit trees, such as citrus trees, cannot tolerate cold temperatures. The University of Florida provides extensive information on the types and varieties of fruit trees that can be grown in North Florida. Apple and pear trees require a minimum amount of chilling hours to produce fruit. Numerous varieties of pear trees will grow in North Florida, but only three varieties of apple trees are recommended. Dorsett Golden produces yellow apples blushed with pink; Anna and Tropicsweet produce red apples. Peach, plum and nectarine trees also require a certain number of chilling hours, but they cannot withstand hot temperatures while the fruit is ripening. Some varieties have been developed to grow in Florida, such as the Florada, Gulf, Sun and UF series. Several varieties of fig trees are hardy in North Florida. They may freeze to ground in the winter but will regrow in the spring. Brown Turkey and Celeste are two common varieties grown in North Florida. 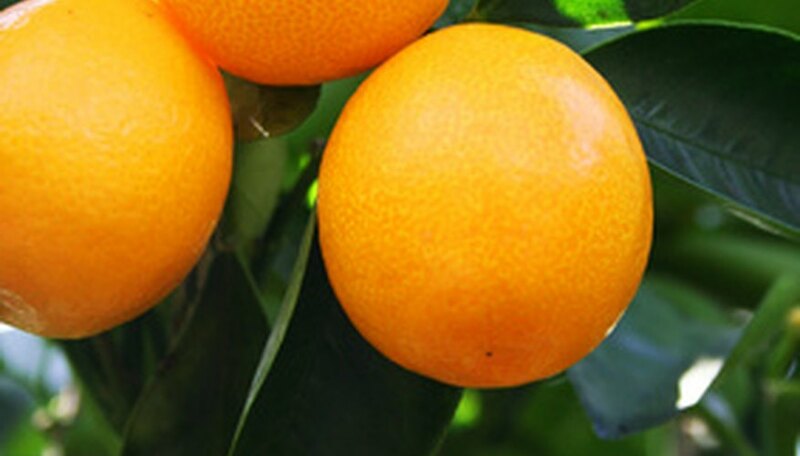 Only two types of citrus trees are suitable for North Florida. Satsuma mandarin orange and kumquat trees can withstand temperatures as low as 20 degrees, but the fruit is damaged at 25 degrees. Numerous varieties of pecan trees grow in North Florida. Some varieties suited to the home garden include Curtis, Elliott, Moreland, Stuart and Sumner. Chinese jujube, or Chinese date, trees have sweet black fruit that is eaten fresh, canned, dried or candied. The fruit of date palm trees is eaten fresh or dried, or used to make syrup, wine or vinegar. Loquat trees bear clusters of small downy yellow or orange fruits that taste sweet to tart, depending on the variety. The fruit of pomegranate trees has purplish-red flesh with an astringent flavor that is used in juice mixtures.